Philadelphia, PA — For a quarter century, the Blue Cross RiverRink season has started on Black Friday to help ring in the holidays. This year, it’s opening up with a very special treat for Philadelphia. Thanks to a generous gift from Independence Blue Cross (Independence), the rink’s founding and sustaining sponsor, ice skating (including admission and skate rental) will be completely free on opening day! Blue Cross RiverRink Winterfest opens at 11 a.m. on Friday, November 23 and closes that night at 1 a.m. with seven different 90-minute skating sessions throughout the day. As the city’s only regulation-sized outdoor ice-skating rink, there will be thousands of skaters enjoying free skating as a way to kick off the holidays. Free skating tickets for opening day are now available to reserve in advance online at http://www.riverrink.com, and more will be available on-site for each session. Tickets will be limited online to four per person and are non-transferable. There is a rain date set for Sunday, November 25. Opening Day will also feature the newest addition to the rink – the Winterfest Express! This kid-sized train, operated by Skelly’s Amusements, will be available for rides throughout the holiday season, providing a complement to the holiday charm of Blue Cross RiverRink Winterfest. The entire experience features outdoor ice skating, a festive Lodge serving seasonal food and drinks from Chickie’s and Pete’s, Garces, and Franklin Fountain, beautifully decorated cabins, thousands of lights twinkling, and of course, the beautiful tree, which will be lit during the two-hour Holiday Tree Lighting Powered by PECO on Friday, November 30, which will be aired live on NBC10. Opening Weekend celebrations continue Friday through Sunday with free hot chocolate samples, wreath making, face painting, an appearance by the Grinch, Storytime in the Lodge, circus arts, and an ELF karaoke bus. A full season of programming includes annual favorites like New Year’s Eve Parties on Ice, the SugarHouse New Year’s Eve Fireworks on the Waterfront, Winterfest Brewfest, Latin Night at the Lodge, Valentine’s Day Sweetheart Skate, and more. Dates: Blue Cross RiverRink Winterfest is open every day from November 23rd, 2018 – March 3rd, 2019 including all holidays. Information about events, pricing, hours, and rentals can be found at riverrink.com. Blue Cross RiverRink Winterfest Sponsors Winter programming is made possible by Independence Blue Cross, Beneficial, Visit Philadelphia, NBC10 and Telemundo62, Liberty Coca-Cola Beverages LLC , PECO and Philadelphia Magazine. DRWC is a 501(c)(3) created in January 2009, exclusively for the benefit of the City of Philadelphia and its citizens. The fundamental purpose of DRWC is to design, develop, program and maintain public amenities such as permanent and seasonal parks, trails, and streetscape improvements to transform the waterfront into a vibrant destination for recreational, cultural, and commercial activities for the residents and visitors of Philadelphia as is consistent with the goals of the Master Plan for the Central Delaware. 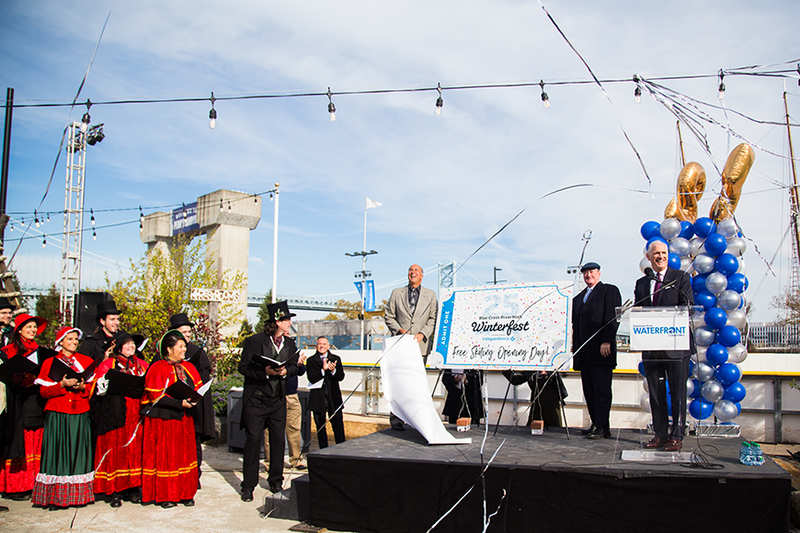 Daily programming throughout the entire year is changing the way Philadelphians see and converse about the waterfront and is helping to create spaces and communities that connect residents and visitors to the waterfront.